Stress Reduction at Work offers mindfulness classes and trainings for the workplace tailored to meet the needs of employers and staff. We will be happy to design something that works for you and your team. Short workshops are another way to introduce staff to the practice of mindfulness. For Genentech, Bill visited a team of Genentech employees at a staff retreat and taught the basics of mindfulness in a crisp and interactive two-hour session. The session included the basics of stress reduction and a mindful communication exercise. For Sandia National Laboratories, a United States Department of Energy research and development national laboratory, Bill worked closely with management to craft a shorter version of the 8-week MBSR curriculum. He modified the language and duration of the practices to appeal to the technically-oriented scientists and engineers that work at Sandia. In addition to teaching two 8-week classes at Sandia, Bill developed and taught a “Mindfulness Essentials” daylong curriculum targeted to those members of the Sandia workforce who didn’t have time to attend an 8-week course but who were interested in learning about mindfulness. A lunchtime series is a simple and convenient way to introduce your workforce to the essentials of mindfulness. For Flixster, a media company in San Francisco, Bill taught five hour-long lunchtime classes over a 5-week period in a conference room. Each class was a mix of simple and short meditation practices, a teaching on some aspect of mindfulness in daily life, and group sharing and discussion. By the end of the five weeks, Flixster staff had a good practical and experiential understanding of what mindfulness is and how to practice it in daily life. For Kimpton, Bill created a 90-minute slide show lecture on the facts about stress and the power of mindfulness for reducing stress. The talk also included short experiential practices like the raisin and STOP exercises, a segment on why multi-tasking doesn’t work, and Q&A. A mindfulness retreat is a wonderful opportunity to train intensively in mindfulness while cultivating a sense of presence, spaciousness, and calm in a quiet country setting. Retreats begin on a Friday night and end on Sunday afternoon. Participants will engage in intensive practice of mindfulness meditation, while receiving didactic information on stress and ways to cultivate mindfulness in daily life. The program also includes mindful communication training, interactive exercises and inquiry, and periods of silence and reflection. 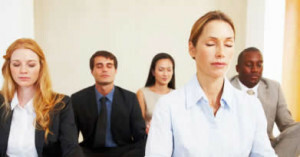 A great way to introduce employees to mindfulness as a tool for stress reduction and personal healing, daylong sessions include beginning instruction in mindfulness meditation, including the body scan. The day also includes periods of didactic lecture on stress and mindfulness, gentle movement exercises, mindful communication practice and tools for working with stressful events. For inquiries about retreats or classes, contact us by e-mail at info@stressreductionatwork.com or call us at (415) 767-5252.